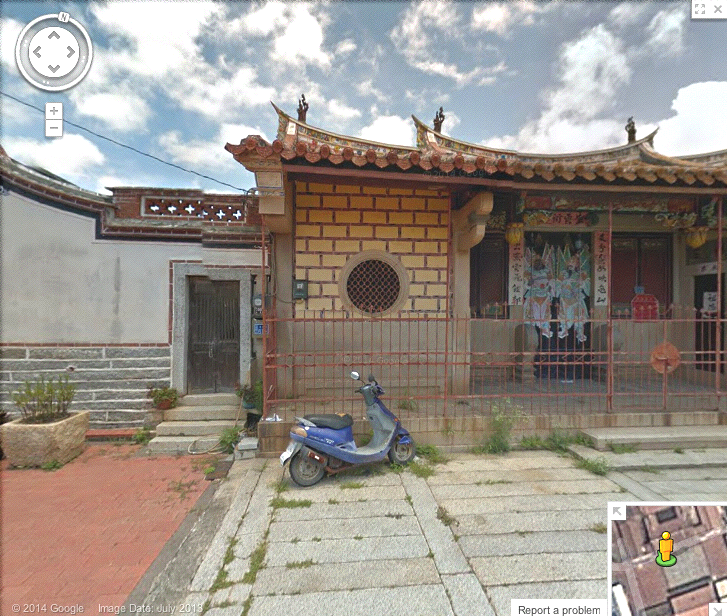 Virtual Paintout - Kinmen Island! 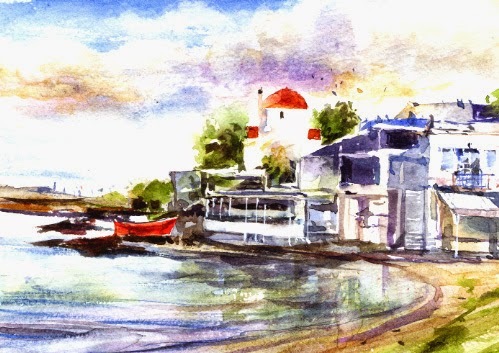 Just when I thought I had run out of time to check out the August 2014 Virtual Paintout, I saw the location was Kinmen Island. 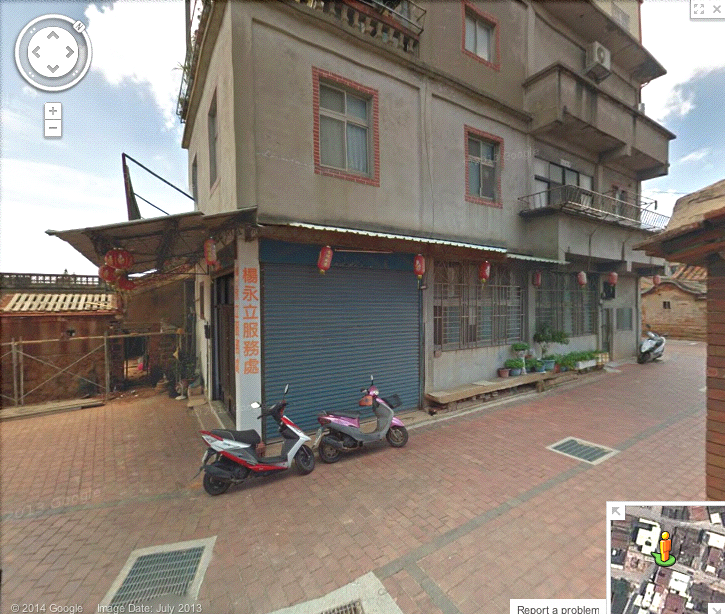 Kinmen is an outlying island of Taiwan, but is actually very close to mainland China. I was curious to look around there. It turned out to be easy to find areas of ancient, traditional Chinese houses with swallowtail roofs which looked to be terra cotta. These compounds were like a maze to look around using Google Street View. Very easy to get lost! Beautiful and so interesting. Around every corner, there seemed to be construction going on, making repairs to crumbling structures. 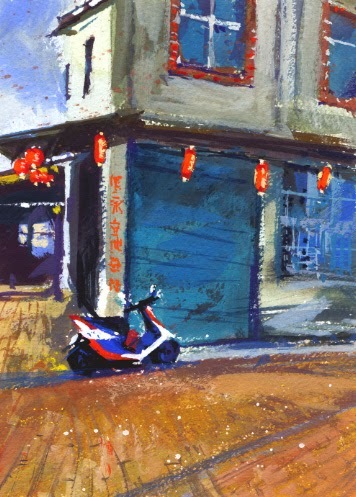 The many motor scooters caught my eye so I included them in my paintings. 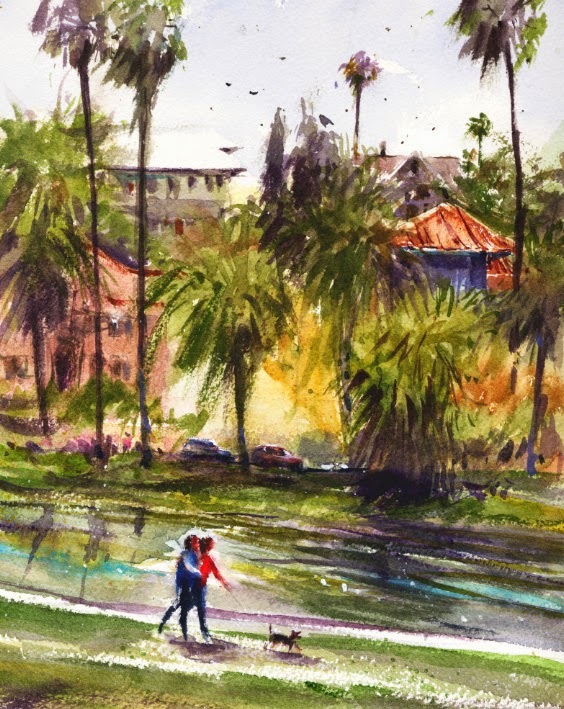 Last month the Saturday paint-out group met at Tournament Park in Pasadena. You and I would think that I've painted at least once at all the nearby parks. But, no. Our paint-out leader who chooses the locations, Barbara Field, is terrific at finding new and different places for us. Tournament Park is located on one side of the Caltech campus. It's managed by Caltech but is open to the public and available for private functions. It's an old and historical park. I've added a photo of a plaque commemorating some of the events that took place there. Another nice day for painting, and the park is full of great shade trees with lots of dappled light. It's kind of secluded, not being on a busy street, so we had it to ourselves. Just some families taking kids to the play area and some dog walkers. 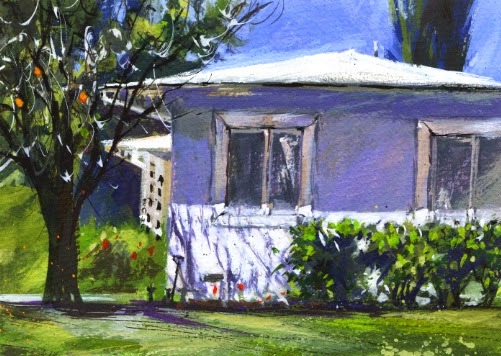 I was interested in the backyards of the homes bordering the length of the park so I chose a picnic table to paint from with a view to a pretty backyard. The sunshine kept moving through the trees and I kept moving too so I could stay in the shade. I was going to add a dog walker but decided on a squirrel instead. I like the cool colors in this piece, maybe because it's near 100 today. 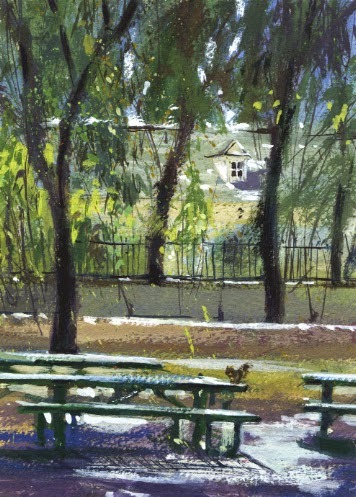 I'm still behind in posting plein air paintings! 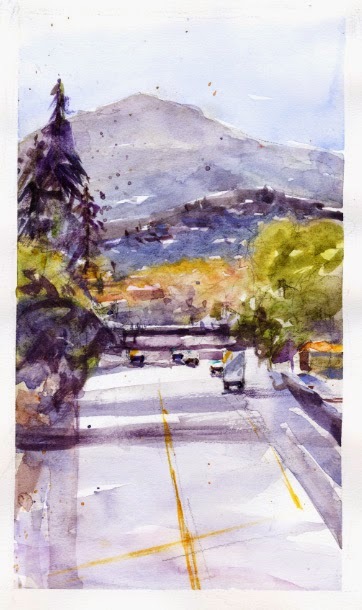 This watercolor is from our group's June paint-out at the historic Richardson House in Sierra Madre. In the 1890's John Richardson built a pioneer cabin at the foot of the Mt. Wilson Trail which was made in 1864. Next door is Lizzie's Trail Inn that by the 1920's was a very popular stop for food for hikers and customers of the Mt. Wilson pack station. Both buildings are now museums for Sierra Madre history and artifacts. We had a beautiful morning for painting, and a large turnout of painters. 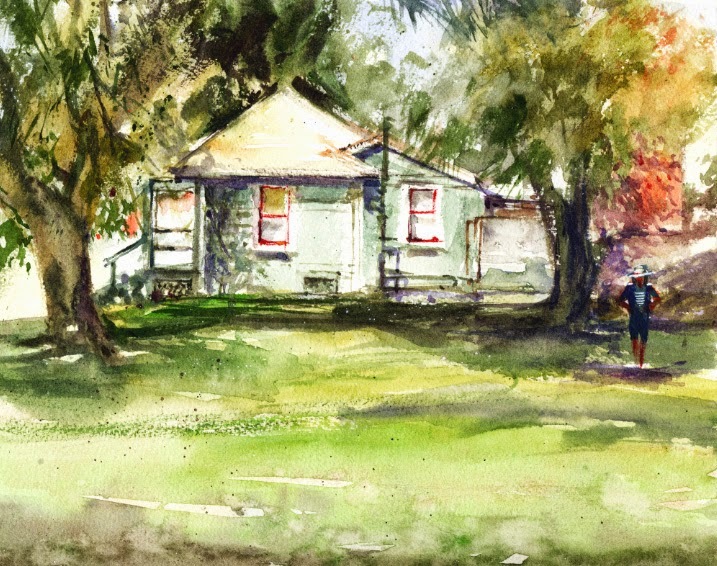 I tried a watercolor of the Richardson House from the east side. I liked the porch area looking light with the darker values around it. When I was about finished, I decided to add a figure. The best, least busy spot seemed to be on the other side of the painting, and a fellow artist was conveniently standing there. I may have created two centers of interest but during our discussion, others thought it worked out okay. I'm always up for a "second reading" I guess! The leader and organizer of our Saturday paint-out group had a "house painting" project for us last weekend. 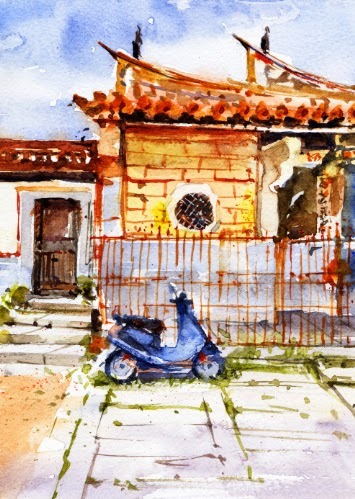 An old friend of hers asked her to paint, in watercolor of course, her home in San Marino. We all thought it would be fun to meet there to try our hand at painting the house. We always enjoy new subjects. I didn't know what kind of house to expect to attempt. San Marino has a very wide variety of home sizes and styles. I've been on two past paint-outs where ornate Victorian houses were the subject and I was overwhelmed with the details. So I was happy to see that it was a simple Mid-Century modern. I thought gouache would work well for this piece. I loved the tree shadows on the stucco which moved quickly with the sun. It's been two months since one of the paint-out groups visited the historic Storrier Stearns Japanese Garden in Pasadena. We were all very anxious to visit this historic garden that we've heard so much about but hadn't visited. The garden was part of a private estate and hidden for decades. It's been historically renovated and is now open only for private parties. It's located behind walls and fences, and seemed to be almost just a rumor with artist friends. We were amazed when we got a first glimpse past the entry gates. The beautiful garden features two connected ponds, bridges, and an authentic teahouse. Since we visited the garden to paint, I've been retouching my watercolor and going back to it to look again. During our brief discussion of the paintings, the group generally thought the water we had painted seemed to look more like a lawn since it was green and murky. 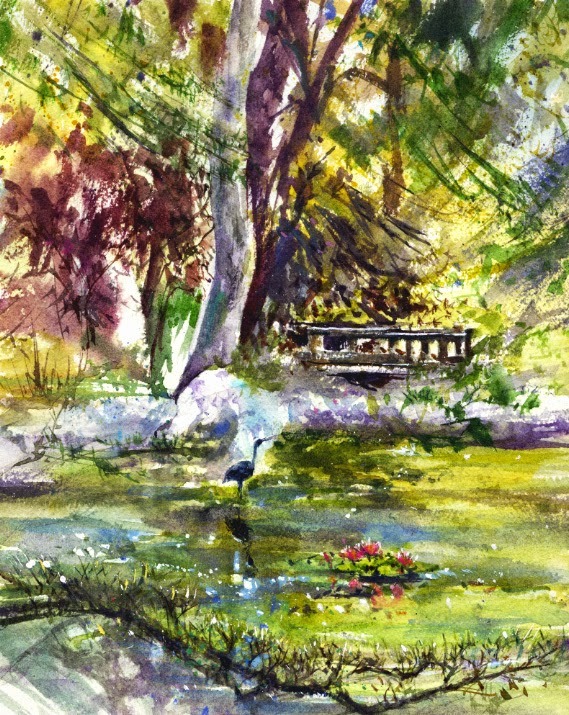 In trying to make my watercolor look more like a pond than a lawn, I've added some blue sky reflections and some bright spots to highlight the crane sculpture I wanted to feature. It was such a lovely morning of painting at the garden and the owners were very generous to allow our visit. Hoping to visit again! I was very lucky to have a spot in Iain Stewart's workshop this past week. 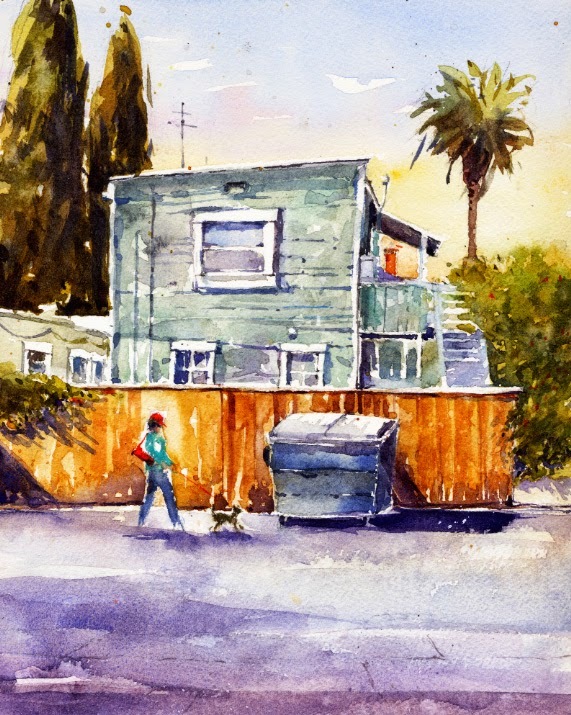 The workshop, titled Sketchbook to Studio, was at Judy Schroeder's wonderful gallery and studio space in the City of Orange, California. Old Town Orange was the perfect location for some plein air sketching and painting which we could develop further in the studio under Iain's expert guidance. Iain is such friendly and fun person while also being a generous and inspiring instructor. What could be better! Well, he's also an amazing watercolor painter. Workshops are an opportunity for me to see how artists I admire translate what they see to the paper. Seeing how they mix colors, handle their brushes, apply paint, and add special touches are as valuable as what they say. I'm happy to have gotten so many terrific tips from Iain's workshop. I need to pay more attention to a careful preliminary drawing before jumping in with paint, and Iain was an excellent artist to watch at all stages. Now I'm also paying more attention to relationships and alignments. I haven't been keeping a sketchbook but I'm inspired to do that now after seeing Iain's amazing sketchbooks. Should be fun thanks to Iain! My last plein air paint-out at Echo Park for this year's lotus season was a few weeks ago, the end of July. The lotuses have more pods drying than new flowers now. I posted my previous paint-out there, which was on a busy Saturday in Paleta Cart. On this most recent visit, I painted my landscape from a spot on a hill in the park. But I still didn't try painting or drawing the beautiful lotus flowers. Some day! The Virtual Paintout 24 means I've been participating for two years! 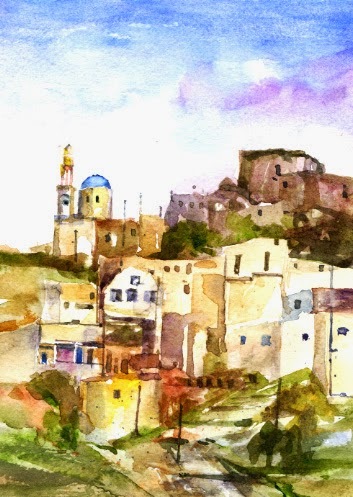 The Virtual Paintout for July 2014 was all of Greece. Wow, kind of overwhelming with so many beautiful views. 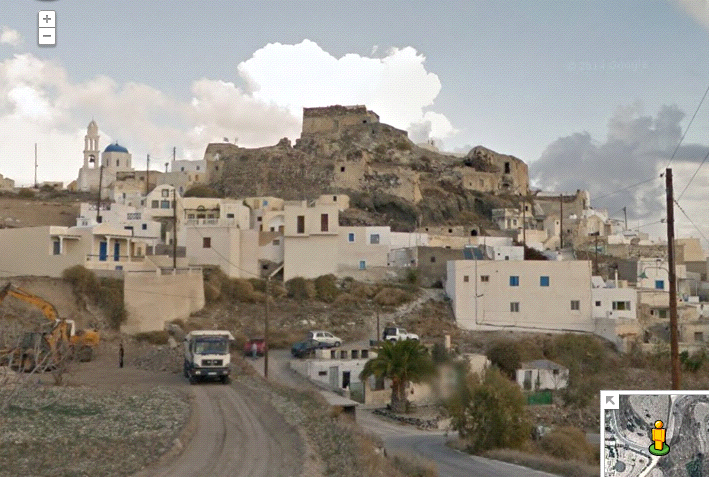 The Google Street View vehicles hadn't been everywhere but certainly photographed many wonderful locations. The thing I noticed most in Greece and the Greek Islands was the gorgeous skies and clouds. And all those white buildings are so charming. 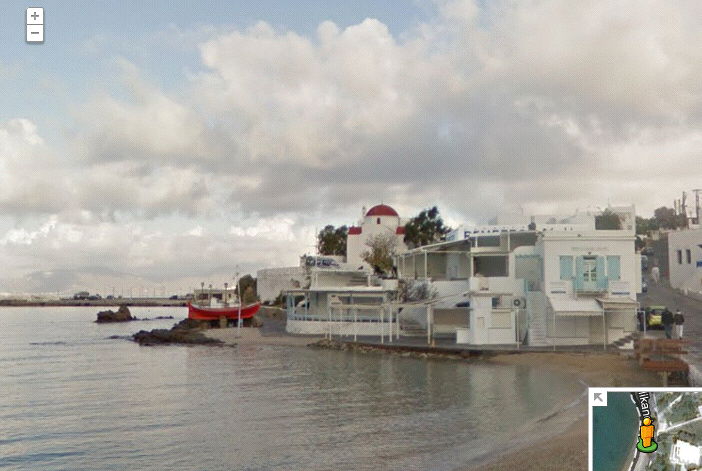 I chose a view on the island of Mykonos and another on Santorini. Both views include a pretty, colorful dome. A pop of color amid all the pale structures. Somehow I'm late with this post and tomorrow I'm off to a week-long workshop with Iain Stewart. I'm very excited to be taking this workshop and hoping to get another blog post done!